Ever wondered how good chefs make their sauces rich and full of flavour rather than that cheap out of the packet floury gravy sauce? 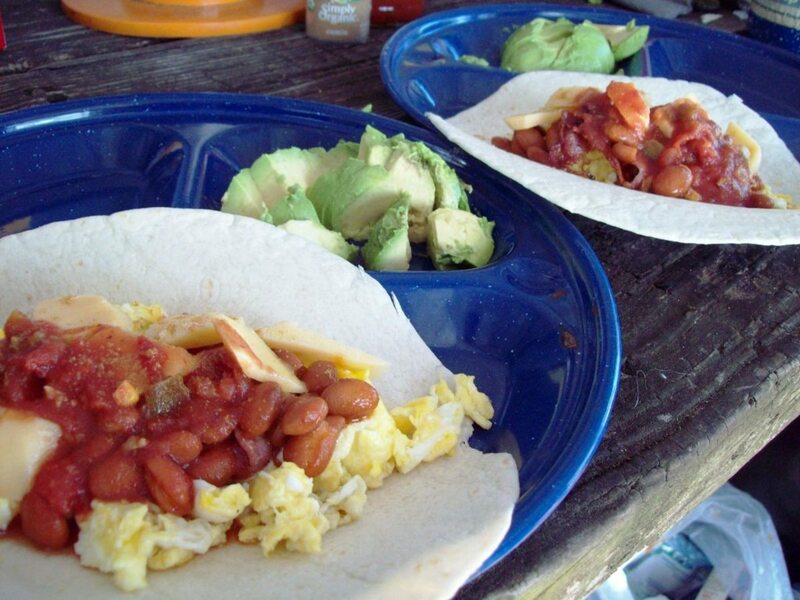 First you need to start with the right ingredients, fresh ingredients! Having spent many years in kitchens, fine restaurants and hotels and making countless stocks, soups and sauces I’m ready to teach you how it’s done. Mirepoix: Selection of chopped vegetables cut to the same size and a size for the duration of cooking. Meaty Beef bones: Bones containing meat and cartilage. Pigs trotters: These are the feet of a pig, these are good in assisting in flavour and they also contain a lot of gelatine for thickening your sauce. 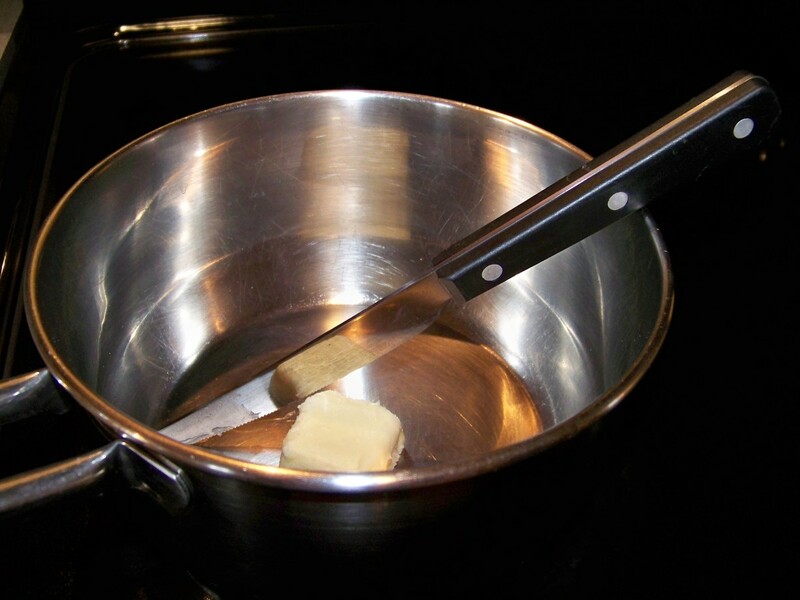 Deglazing: Is a term used to remove sediment from a pan after the cooking process. 6 to 8 hours for the stock of this quantity however in commercial kitchens sometimes these times vary up to 9 to 12 hours due to the quantity and size of ingredients therefore requires longer cooking times. Firstly you will need a good sized oven tray or good sized frying pan to brown your bones. If using an oven tray place your meaty beef bones into the tray along with the pig trotter and place into a hot oven to brown them. There is no need to place oil in the tray because there is enough natural oil in the meaty bones and besides we want to keep oil out of the stock. During the browning of the bones turn them so they become brown on all sides and it’s at this stage you can add ½ your tomato paste liberally to the bones as well browning the paste. Once your bones are nicely browned it’s time to remove them from the oven. Carefully remove the beef bones and pig trotter from the tray and place into the empty stock pot. Now you need to tip off and discard the remaining fat that has collected in the tray. Once discarded place your tray onto the heat of your cook top and once hot deglaze with a ¼ bottle of the red wine scratching the sediment off with a wooden spoon. Let the red wine boil away whilst scratching the sediment with the spoon. Once the tray is clean you can now tip the red wine and sediment onto your beef bones in the stock pot. It’s now time to brown your vegetables in the same tray as you did the beef bones, again there is no need to put oil in the tray. Place in a moderate to hot oven and monitor them so they don’t burn. 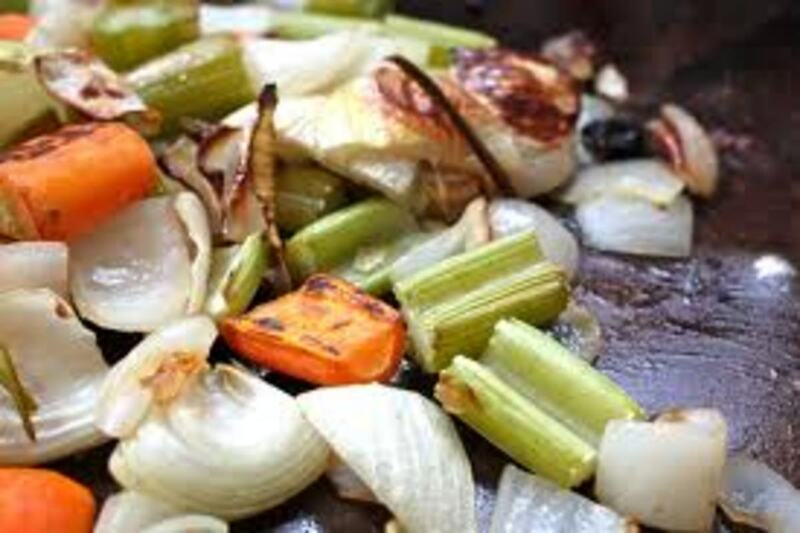 The idea is to caramelize your vegetables, the browner you can get them without burning them the better the stock will be. Add the other half of tomato paste to your vegetables at this time as well. 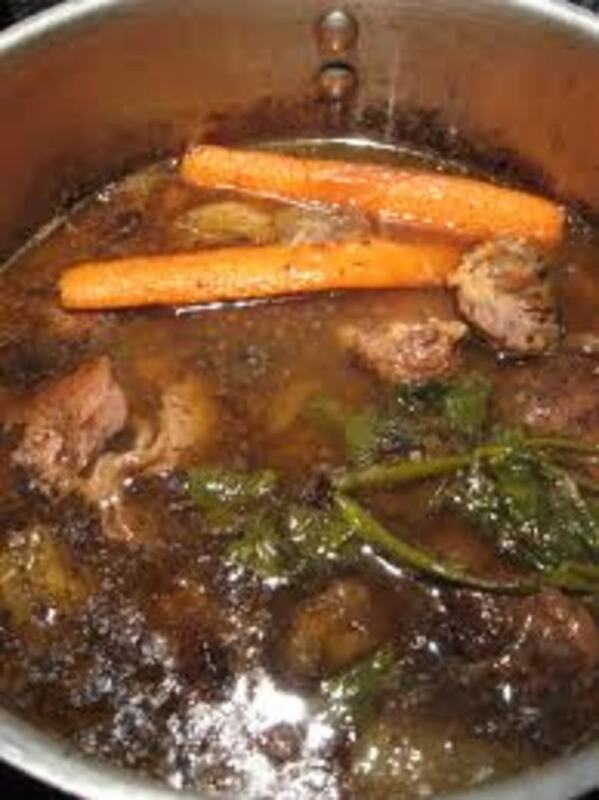 Once your vegetables have browned it’s time to remove them from the oven and place them on top of your beef bones in the stock pot. Now add cold water to the stock pot so you’re covering the vegetables and bones by about 1 to 2 inches and add your parsley stalks and thyme sprigs. Turn on your stove top and you want to bring the stock just to the boil, once it reaches the boil turn the stock down to a low simmer or until you can just see little bubbles rising to the surface. You’re going to need to skim the stock as well by using a ladle to skim the surface, what we call 'scum' in the industry, a orangey red colour foam which is excreted from the bones, vegetables and tomato paste. Cooking time is approximately 6 to 8 hours. If the stock gets a little low you can add more water to it but you shouldn’t have to do this too much as the stock should just be ticking over and not boiling. Once the stock has been cooking for 6 to 8 hours give it one final skim and you now want to strain the stock through a conical strainer with cheese or muslin cloth into another pot being careful not to get any bones or vegetables into the new pot. You can now discard the bones and vegetables. 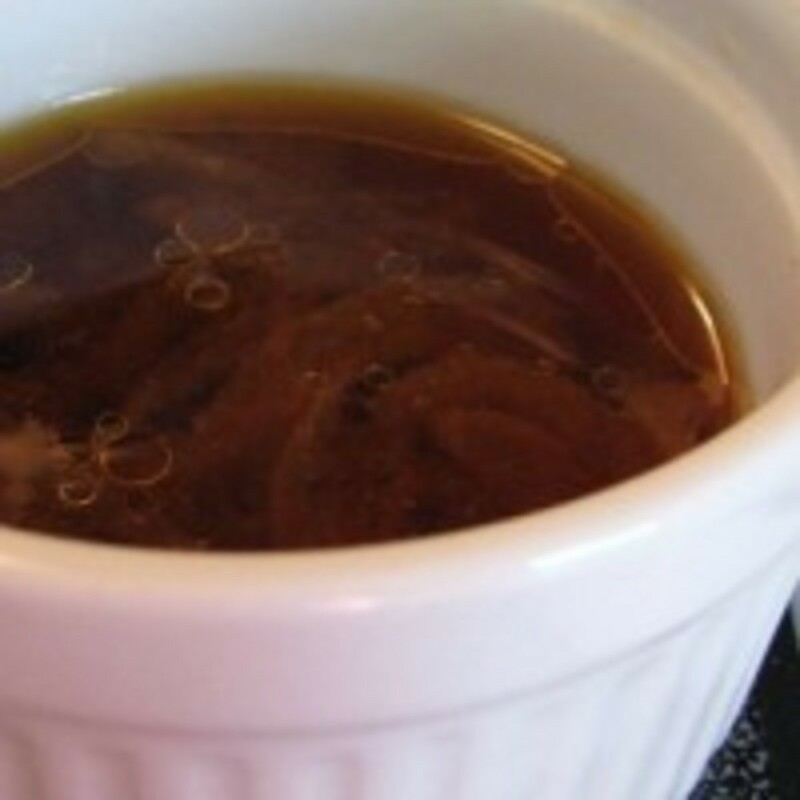 Now you have made brown beef stock, you can use this as a base for soups and sauces. Place your stock onto the heat and pour the remaining bottle of red wine in with the stock. It’s now time to reduce your stock by boiling it and reducing it down to a glaze known as Jus. Typically if you start with 10L of stock you will finish with 1L of rich glaze. During the reducing stage you will need to skim the stock also removing impurities from the sauce. As the stock is reducing you will notice the stock becoming thicker and richer in flavour. Use a tablespoon to taste the stock and normally if it’s coating the back of a spoon it’s ready. Once you’re happy with the consistency you can turn the heat off and allow to cool or use straight away. Once the Jus has been refrigerated it will resemble a jelly texture but once heated will transform back into sauce. You can store the jus in plastic containers or wrap it in cling film portions and freeze and pull it out as you need it. Always start a stock in cold water by doing this all the flavours leach out of your ingredients and into the stock giving it flavour. Do allow time for the stock to develop a full rich dark flavour. Don’t burn your vegetables or bones. Don’t start a stock in hot water by doing this you are sealing in all the flavour of your ingredients. You want them to leach out into the stock. Don’t stir a stock, when skimming you are taking the scum off the top only. 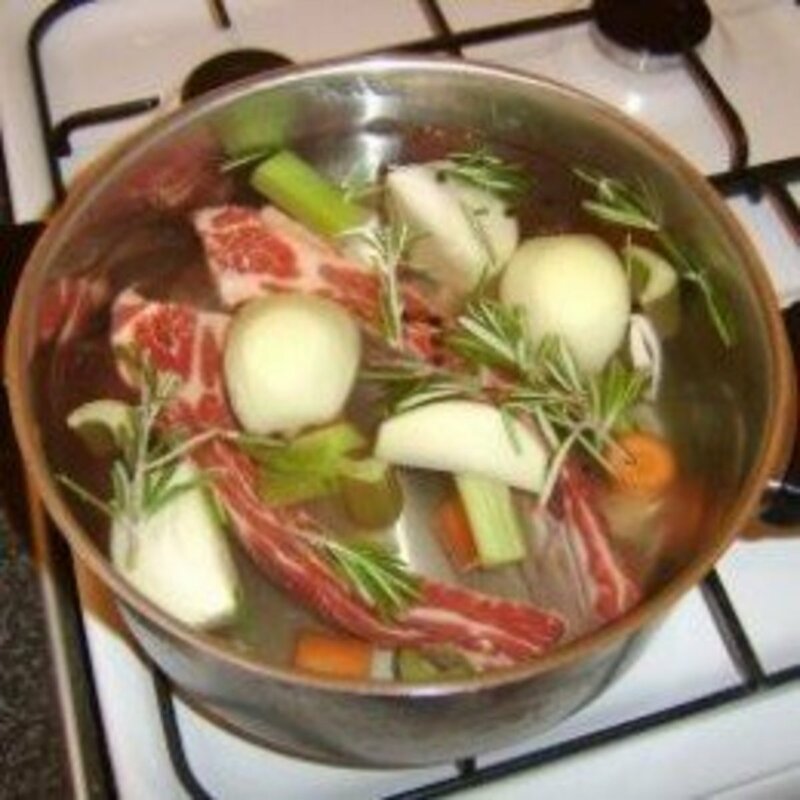 Don’t boil a stock whilst you have bones and vegetables in the pot otherwise it will make the stock cloudy. 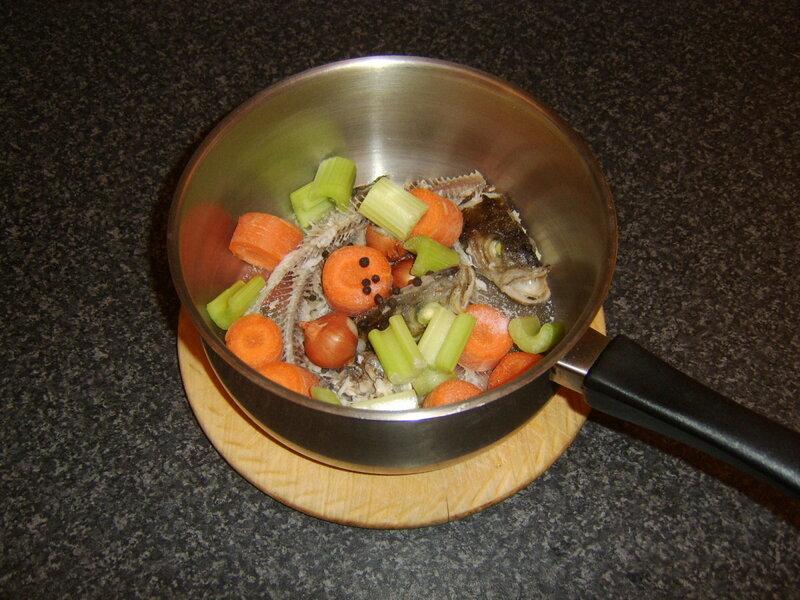 · Place bones and vegetables into stock pot. 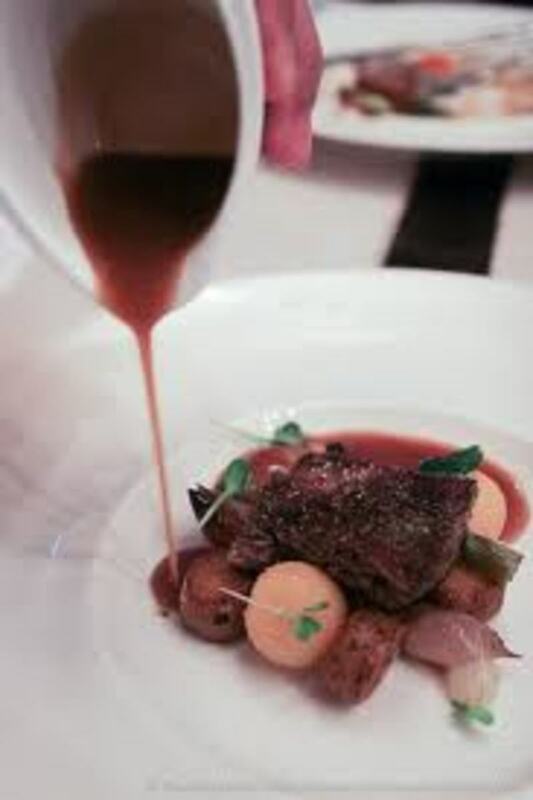 · Tip off any fat that has accumulated in the tray and deglaze with red wine scrapping the sediment and adding to the beef bones and vegetables. 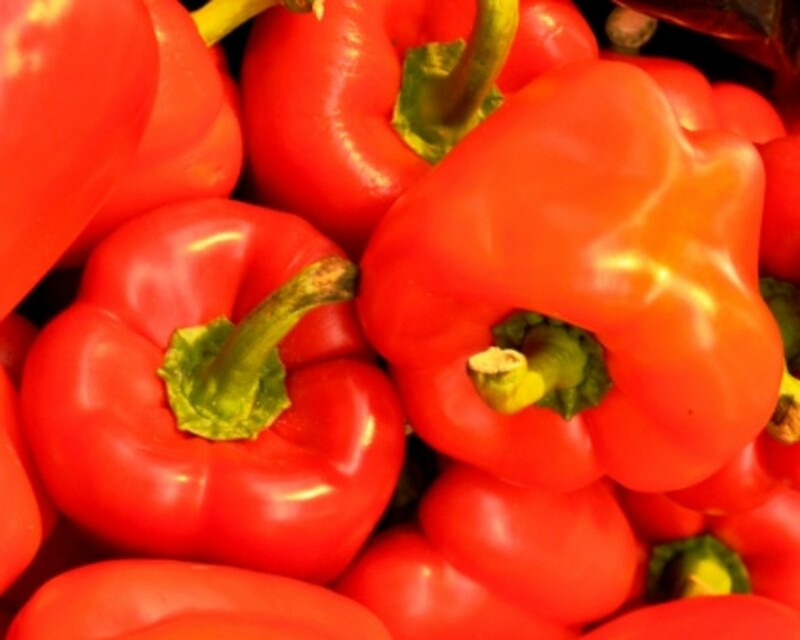 · Cover bones and vegetables with cold water and cook for 6 to 8 hours. · Skim the scum that will accumulate on top of the stock and discard. · Strain the stock and either use as a base for a soup or casserole or reduce down to a glaze to top your favourite steak or roast dinner. If you want to be more adventurous try adding twists to your sauces by adding caramels, plums and berries to your stock during the reducing down stage of your Jus. Delicious! 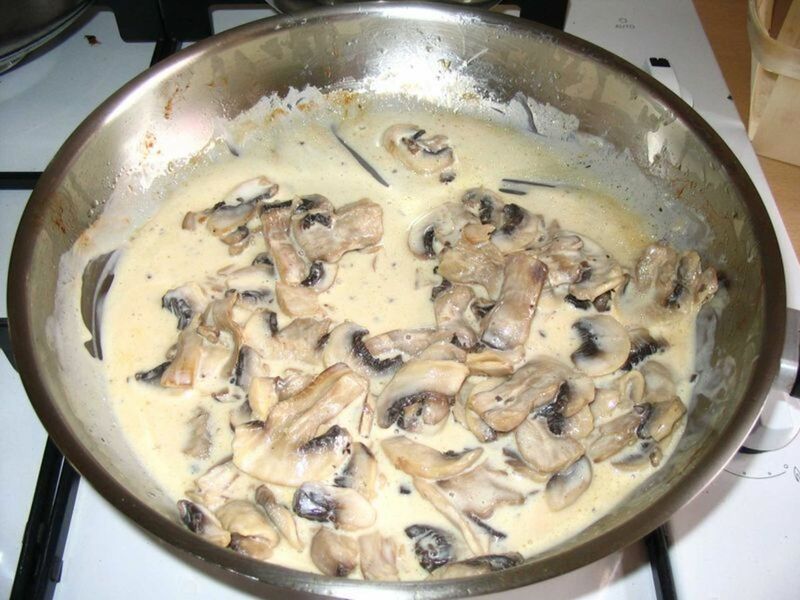 How to make a basic thin, medium and thick white sauce with how to pictures. Absolutely a great method for the Jus. Really helps for my career. Thank you. I found this page really helpful, I am a chef but its been a long time since I had to make stock and all the points of care are here. Thanks mate!